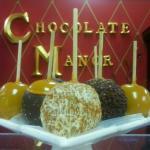 Description: Chocolate Manor serves desserts. We are a family owned business which specializes in handmade chocolates such as assorted toffees, caramels and truffles. We also make a small selection of drinks such as iced and hot coffee as well as Italian sodas. Most of our chocolates are priced by weight so you are welcome to stop in and buy one piece or however many you prefer. We can either package your chocolate to go or you are welcome to sit back and enjoy your chocolate at one of our small tables. We hope to see you! Been to Chocolate Manor? Share your experiences!